Abstract : Combining procedural generation and user control is a fundamental challenge for the interactive design of natural scenery. This is particularly true for modelling complex waterfall scenes where, in addition to taking charge of geometric details, an ideal tool should also provide a user with the freedom to shape the running streams and falls, while automatically maintaining physical plausibility in terms of flow network, embedding into the terrain, and visual aspects of the waterfalls. We present the first solution for the interactive procedural design of coherent waterfall scenes. 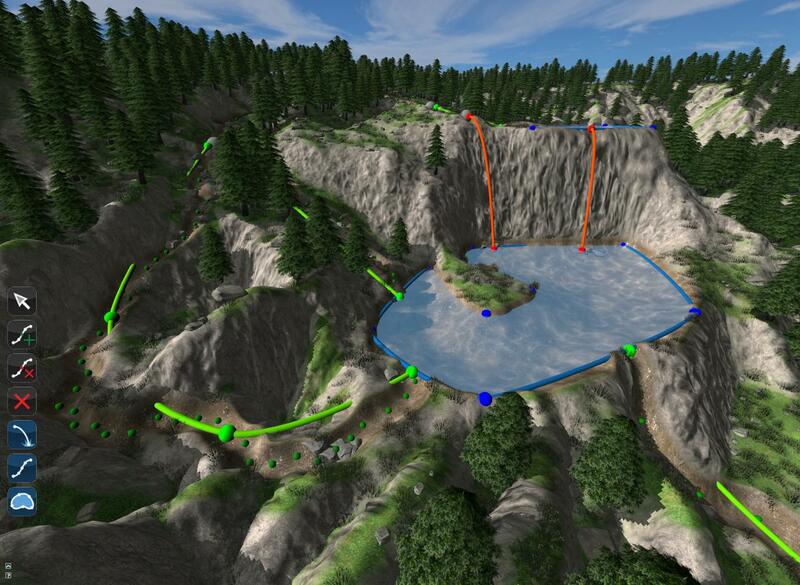 Our system combines vectorial editing, where the user assembles elements to create a waterfall network over an existing terrain, with a procedural model that parametrizes these elements from hydraulic exchanges; enforces consistency between the terrain and the flow; and generates detailed geometry, animated textures and shaders for the waterfalls and their surroundings. The tool is interactive, yielding visual feedback after each edit.